4. Strong labour market institutions that give workers bargaining power on their wages and working conditions. For this reason, the Sydney Peace Foundation is proud to have Professor Stiglitz as our 2018 Sydney Peace Prize recipient. Aaron Patrick appears to rue the fact that Professor Joseph Stiglitz has moved beyond standard neo-classical economic theory in pointing out the flaws of monopoly-capitalism, and especially the now entrenched failure of this system to deliver a fair rate of wages to workers. Stiglitz is clearly very concerned about the disempowerment of working people and the rise of large-scale private monopoly interests. But it would be a mistake for readers to draw the conclusion that Stiglitz promotes a negative or divisive perspective on economics. On the contrary, a close analysis of Stiglitz’s writing reveals his brilliance in reconciling the best aspects of individualism and collectivism. One of the strongest examples of this is his work on the Henry George Theorem. Thereby, he demonstrated the multitudinous economic advantages of lifting taxes from labour and its products and funding community services through a ‘single tax’ on unimproved land values. You don’t need to be a Nobel Prize winner to realise the good sense in drawing public revenue from the windfall gains of land speculators rather than from the hard yakka of working people. 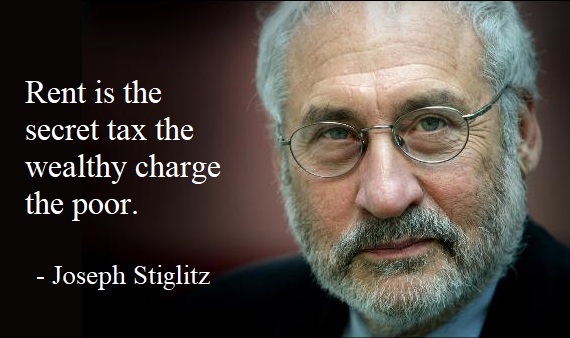 More strength to your arm, Professor Stiglitz! You suggest Professor Stiglitz is “one of the world’s most-cited critics of capitalism” as if that is a bad thing. The article tries to suggest the professor’s positions have changed over the years. His Sydney Peace Prize was “for leading a global conversation about the crisis caused by economic inequality”. That was the subject of Stiglitz’s doctoral dissertation in the 1960s – some consistency there. A serious analysis on Stiglitz might instead point to how his thinking has developed over the years. Very early on the part of his work that earned the Nobel Prize included the economics of asymmetric information – the type of asymmetry we have seen uncovered in the banking royal commission. He showed that small asymmetries can have profound implications for the workings of the economy. That also has implications for our democracy. But the determination to find inconsistency in his work leads the article to two propositions from Stiglitz separated by 35 years. 2. ‘He criticised reductions in Sunday penalty rates, and said employees’ bargaining power had been “eviscerated”. Following his argument properly shows that proposition 1. is the outcome in a competitive economy at equilibrium. Proposition 2 obtains in the Australian real-world; a monopolist/oligopolistic economy where concepts such as equilibrium are rather meaningless and where heavy regulation of workers’ rights have dramatically reduced their relative bargaining strength.